Marisa Loreno has moved around a lot over the years, but something that has remained the same is her love of living a zero waste lifestyle. Marisa or thelittleredheart on Instagram, dedicates her account to showcasing her life and all the tools she uses to create no waste. Her photos are simple yet effective, and have super insightful captions that both entertain and educate. We have been a fan of her work for months now. Since we started Create Simple, we are all about learning to create a more simple life and reduce waste as much as possible, so we thought Marisa was the perfect fit to let us in the know when it comes to being a zero waster. We met at Garry Street Coffee, a tiny cute coffee shop in downtown Winnipeg. There we sat and discussed coffee, moving and being zero waste. She was super into Create Simple and we were super into her passion and perspectives when it came to living more sustainable. After our initial meet up, we thought it would be a great idea ask her 10 questions when it comes to her lifestyle and hopefully it would provide you with some super cool insight into what goes into it. When did you decide to go zero-waste and was there a reason behind it? Both questions are much intertwined for my own personal journey to zero waste. I think the first big shift in how I saw waste was when I moved to London, Ontario and the city just plopped its trash in piles on the boulevard, or for us who lived in a little townhouse cul-de-sac, one GIANT pile of trash. Every week I was confronted with the mass amount of garbage people produced, at the time one small kitchen bag of trash was what we threw away. I started to pay a bit more attention to my own personal trash I created, but that didn’t take it much further than being aware. We moved to Winnipeg and we cut our belongings by 2/3 and voraciously started the journey to minimalism where I stumbled across the concept of zero waste from the blog Going Zerowaste. Fast forward about a year and I had a head injury which sort of fuelled me to cold turkey and quit plastic for plastic free July. Two months later we moved and I put the trash can in the basement and never looked back. I am considerably odd when it comes to the journey to zero waste, but it worked for me and that is all that matters. What has been your biggest struggle so far being zero-waste? My husband would say, “Doritos.” I think that my biggest struggle IS being okay with trash that does happen. The gifts people give you, the flyers that just show up no matter know much you say no, the things you can’t find in zero packaging, etc. Are there any products you miss having? If so how did you combat that? I would say that there was not a specific product that I miss, but sometimes I miss the convenience of it all. What is your biggest tip for people wanting to start out zero waste? An inventory or audit of what you do have to make the switch in your own home. Those water bottles, containers, odd things that can double as bulk bags are all very important to the concept of zero waste, because we don’t want this to become just a different consumerist movement. What is your biggest motivator for keeping with this lifestyle? The community I have involved myself in and not having the trash around, I love it not creating trash. Do you have any zero waste people or companies that are great inspirations or provide good content? 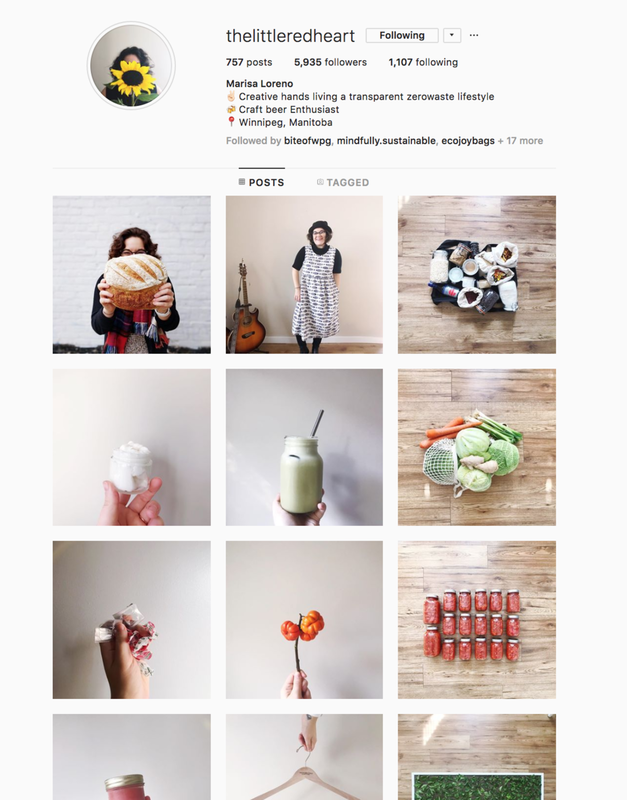 I use Instagram as my go-to-platform and my favourites for real, nitty gritty, zero waste content is Green Indy Blog. Polly keeps it real with a dash of dry humour that I love. For inspiration and casual lifestyle moves, I enjoy Celia from Litterless, her minimalist style and smart ideas always keep me inspired. Another would be Shia of Wasteland Rebel, who also has a zero waste book out that I have enjoyed reading. She is a very minimal minimalist, composts in her tiny apartment that she shares with her partner, and generally seems like a pretty cool lady. I have a tendency to gravitate towards female content creators, but one of my all-time favourites is Zero Waste Guy. He keeps me confronted with the trash that I no longer create and showcases zero waste in more of a grand scheme than just the individual. What is a common misconception when it comes to zero-waste? That we do not create any trash and that low waste & zero waste are conceptually different, they aren’t, just a different label on the same can of worms. When I figure this out I’ll be sure to let you know. Seriously, though, I think everyone is going to have different hurdles to jump. For some friends, humour has been the best, for one side of my family bluntness has been best, and for my family, education has been key. I think it is probably similar to getting your friends and family on board when you go vegan. Places in Winnipeg you like to go to get waste-free products? I am not much of a shopper, but I enjoy popping into Public occasionally for low waste goodies. Generation Green has a nice selection of metal containers and to-go ware. I also run a small online zero waste shop called Fullerton’s Plain Goods which is focusing on simply what you need from companies and makers that have the same ethos as myself and my lifestyle. Thank you again to Marisa for sitting down and sharing her insights on being a zero waster in Winnipeg. Be sure to follow her on Instagram and feel free to reach out and ask her any further questions you may have. She is a super great person to chat with and I’m sure would love to share.